In August 1914 the German main attack was conducted by the 2nd Army. It had the missions of taking the vital fortresses of Liège and Namur, and then defeating the Anglo-French-Belgian forces in the open plains of northern Belgium. 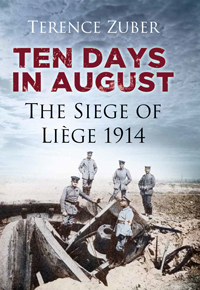 The German attack on the Belgian fortress at Liège from 5 to 16 August 1914 had tremendous political and military importance, and yet there has never been a complete account of the siege. The German and Belgian accounts are fragmentary and biased. The short descriptions in English are general, use a few Belgian sources, and are filled with inaccuracies. Making use of both German and Belgian sources, and supported by tactical maps, this book for the first time describes and evaluates the construction of the fortress, its military purpose, the German plan, and the conduct of the attack. Previous accounts emphasise the importance of the huge German ‘Big Bertha’ cannon, to the virtual exclusion of everything else; Ten Days in August shows that the effect of this gun was a myth, and reveals how the Germans really took the fortress, and thus set the scene for perhaps the most destructive conflict in history.